Dr. Gi Yeon Koh, violist, earned her B.M. 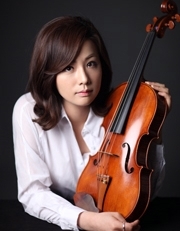 in violin from Sookmyung Women’s University (SMU) under the tutelage of Jong-Wha Hong, M.M. and G.P.D. in violin at the Peabody Institute of the Johns Hopkins University where she studied with Herbert Greenberg, and M.M. in viola and A.D. in violin and viola at the University of Cincinnati, College-Conservatory of Music (CCM) where she studied with Dr. Won-Bin Yim and Dr. Catharine Lees. Most recently Dr. Koh completed her D.M.A. as a double major in violin and viola. While pursuing her studies at CCM, she also served a vital role as a Gee Scholar. Dr. Koh premiered the Rózsa Viola Concerto in Seoul, Korea at SMU’s Alumni concert in August 2018. She also presented recitals on both violin and viola at Jarson-Kaplan Theater in the Aronoff Center (Cincinnati) and made her New York solo debut recital on violin and viola in New York’s Carnegie Hall in 2017. Dr. Koh has also recently performed as guest artist at the University of Wisconsin in Whitewater, for SMU’s 110th Anniversary concert as a representative Alumni; as well as a debut recital at Kumho Arts Hall in Seoul, Korea. Recipient of top prizes in competitions and frequent soloist with orchestral ensembles, Dr. Koh has performed with the Cincinnati, Charleston, and Annapolis Symphony Orchestras, Lexington Philharmonic, and the Chicago Civic Orchestra. Collaborating with Dr. Lees, Dr. Koh has cultivated a unique three-year International Event Exchange between CCM and SMU, linking the institutions of which she is an alumna. She has taught chamber music in the CCM Preparatory Department and is currently a member of the adjunct viola faculty at CCM as well as a member of the adjunct violin/viola faculty at the University of Kentucky in Lexington. B.M., Sookmyung Women’s University, Seoul, Korea, 2005 (Violin Performance ). Graduate Performance Diploma, Peabody Institute of Music of The Johns Hopkins University, Baltimore, Maryland , 2007 (Violin Performance ). M.M., Peabody Institute of Music of The Johns Hopkins University, Baltimore, Maryland , 2008 (Violin Performance ). Artist Diploma	, College-Conservatory of Music, University of Cincinnati, Cincinnati, Ohio, 2012 (Violin and Viola Performance ). M.M., College-Conservatory of Music, University of Cincinnati, Cincinnati, Ohio, 2013 (Viola Performance ). D.M.A., College-Conservatory of Music, University of Cincinnati, Cincinnati, Ohio, 2018 (Violin and Viola Performance).